Cyrsti's Condo: Just Who the Hell do You Think You Are? In my previous Cyrsti's Condo post, I mentioned the recommended way to start my journal-with the question of who did I think I was? Then I was positively blown away with the first question: how did I feel about being a woman? Then list 20 words I associate with "femaleness". Then, the second question asked "Did I ever consider being a man?" By this time I had barely noticed what the rest of the journal questions pertained to, I was so stunned. As my noggin began to clear though, I began to think the questions through. I simply flipped the "man question around: "Did I ever not consider being a man and how much pain did it cause me?" Again, I will write down 20 words. 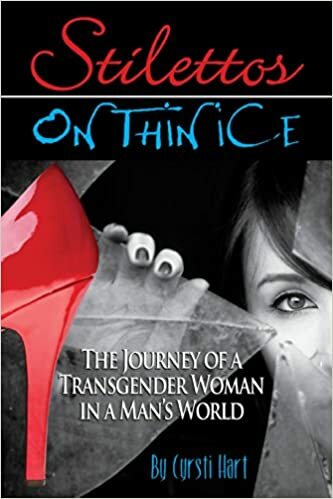 In future posts of course, I will pass along some of the other points from the journal list, such as if I wrote a book about my life (I did) what title would I give it "Stilettos on Thin Ice." As well as other relevant questions about the type of women I get along with best, etc. So, plenty of thought and words to pass along to all of you soon!! !